A BoudieBabe is a photographer who is committed to empowering more women through the art of boudoir photography. A boudiebabe is ready to throw away all their past excuses & turn their passion for boudoir into a full time photography business! A boudiebabe doesn’t let anyone or anything get in the way of their goal to help others while changing their life & business for the better everyday! #26 Adventures in the Great Outdoors: Boudoir Edition! I'm coming at you with tips and tricks on where and how to shoot boudoir without a studio, and without a room! Let's go outside and shoot some amazing boudoir photos! I'm sitting down to talk with Certified Professional Boudoir Photographer Cassie Bodner about how her business and her life have changed now that she's gone through the Boudoir Certified program! Her story is so inspiring and the transformation she experienced is unbelievable. Give this a listen! Hey Boudie Babes! With the new year, I wanted to reconnect with my story and clue you in to everything that I've gone through to get to this point. From dropping out of college and shooting every single kind of photography under the sun, to building a 6-figure boudoir photography business and a coaching business, it's been a wild ride. Listen to my story, see if it sounds familiar, and then reach out and connect with me! If you want to be a successful boudoir photographer, consistency in your services and avoiding burnout is key! That's why I have 5 Core Poses that I use for every client, no matter her wardrobe or style or shape, to make sure that I always have a solid gallery. Check out this week's podcast episode to learn what core poses are, what mine are, and how you can pick core poses of your own! #22 Is Your Price List Set Up To Attract Your Ideal Client? Setting the prices for your photography services and packages is an art form. Not only do you need to set them to cover your costs and make a living, but you need to set them to attract your ideal client, too! In this podcast episode, I'm walking you through the whys and hows to help you assess if your price list is attracting or repelling your ideal client. #21 Do You Have What It Takes To Be Boudoir Certified? You've heard me talk about my one of a kind program Boudoir Certified that helps photographers of every level build a six-figure business with boudoir photography. But did you know that there's an enrollment process? Yup! I don't let just anyone into the program. Listen to this week's podcast episode to hear why, and to see if you have what it takes to be a Certified Professional Boudoir Photographer! Getting new clients is exciting and fun, but getting repeat clients is when you know you're doing something right! I'm giving you a peek into my methods on how I wow my clients and encourage them to book a shoot with me again, assuring constant business and happy customers! Struggling to find photography clients? Confused as to why you're not booked out yet? This podcast episode will help you reevaluate your marketing, platform, business, and presentation to uncover the secret reasons your business isn't growing, and how to fix it! This is a must-hear for every photographer out there! Good customer service and an amazing experience are what will get your clients to buy more, recommend you, and become repeat clients! Today I'm giving you tips on how to elevate your client's experience before, during, and after the shoot! #17 Do You Need a Bed To Shoot Boudoir? I've had a lot of people ask me if a bed is absolutely necessary for a boudoir shoot, and I'm telling you the surprising answer! Boudoir is for every woman! No exception! I'll give you a few tips and tricks on how to shoot for different body sizes, and even give you a secret truth behind posing rules! Have a tiny studio or no studio at all? Worry not, because you can still take a ton of amazing photos! I'll give you my tips and tricks on how in this episode. IPS = In Person Sales. If you're still doing that days or weeks after your shoot, you're wasting time and losing money! I'm going to teach you a better way to structure your sales! I'm giving you an inside look at my photography business to show you the most popular products that my clients buy again and again! Add these to your business and you'll get consistent sales. We all get the urge to quit our photography business from time to time, but you shouldn't do it unless this one sign shows up! Teri graduated from Boudoir Certified in September!! Congratulations to her!! Even better, she was willing to sit down and talk about her experience. It's amazing to hear how in just three months her entire business has transformed!! #10 If You're Not Doing These 3 Poses, You're Losing Money! Hey photographers! If you're not incorporating these three easy poses in your boudoir shoots, you're missing out on huge sale opportunities! Build your business and brand with confidence! Here are my tips on how to create the perfect album for your brand. #8 Why I Hate Client Closets! Hey photogs and boudie babes! Today I'm going into the topic of client closests, why I hate them, and what you should do instead! 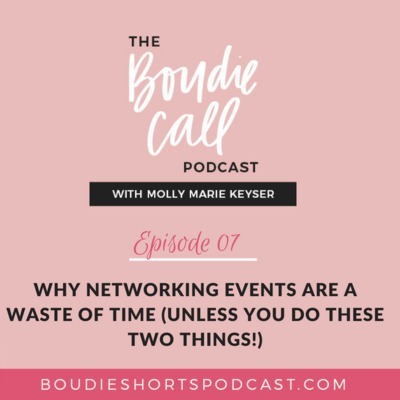 Networking events can be a waste of time unless you do in with these two tricks up your sleeve. In this episode, I'll teach you how to make the most of these events and walk away with sales! This is episode #6 and today I talk about what JC Penney did right... I'm going to share with you what I learned from JC Penney that DOUBLED my photography sales. This is Episode #5 and today we are going to talk about what the photography industry doesn't want you to know. Let's chat about what you really need to get started in photography. This is episode #4 and today I talk about the pros and cons of DIY design for your studio. I'll also share my secret weapon for design - and trust me, you will love it! Thanks so much for listening to the Boudie Call Podcast! #3: You’re losing money because of this and it’s not helping your clients either!!!! This is episode #3 and today I talk about what it is that's losing you money and making your clients unhappy! Thanks so much for listening to the Boudie Call Podcast! This is episode #2 and today I talk about Why I don't recommend partnering with other businesses. In this episode, I will tell you why it might be a smart idea to wait until you start calling all your local business to talk about a partnership. Thanks so much for listening to the Boudie Call Podcast! This is episode #1 and today I talk about Why the photography industry is telling you lies and the only 3 things you need to get started. In this episode, I will tell you what you need to get started in your photography business and I'll touch on the things you don't need (hint: start with the basics!). Thanks so much for listening to the Boudie Call Podcast!